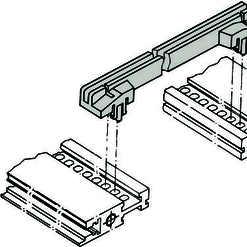 19” standard subracks serve for the acceptance and mounting of pluggable subunits such as PCBs, pin blocks or cassettes and contain a wiring field for the used subunits as well. 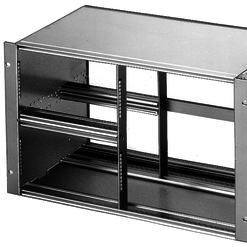 19” standard subracks are made up of two side panels, four aluminium profile rails (module rails) and two angles on the sides which are used for the mounting of the subrack in a 19” cabinet or 19” case. 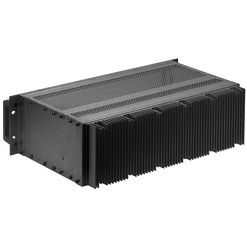 The 19” standard subracks from Fischer Elektronik are available in the height units 3 and 6U, in three different insertion depths as well as in simply subdivided designs. The surfaces of all single components of the 19” standard subrack are natural colour anodised. For the use under electro-magnetic parasitic drags Fischer Elektronik offers special EMC 19” standard subracks. In contrast to the 19” standard subracks those special EMC protected versions have an electrical conducting surface (transparent passivated) and they are closed with a top and bottom panel. 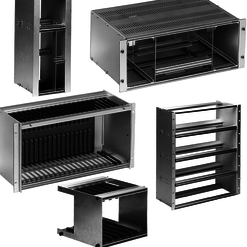 For both versions of the 19” standard subracks there is a wide range of accessories in our programme such as guide rails, handles, insulating- and threaded rails, cover panels, back panels wiring protection as well as Z-rails for connectors and back panel heatsinks for a better heat dissipation.